(Chris Detrick | The Salt Lake Tribune) Local healthcare professionals attend the Unmask My City: Air Quality, Climate Change and Your Health event at Impact Hub on Tuesday. Environment » With new EPA ruling, groups urge residents and lawmakers to press for clean air as a health issue. More Utah residents and community leaders need to speak out against air pollution, advocates are saying. Air-quality campaigners are enlivened after the U.S. Environmental Protection Agency labeled two Utah communities as “serious” nonattainment areas — a decision that essentially censures the state for failing to meet a 2015 deadline on complying with federal rules for small particulate pollution. The Salt Lake City and Provo metro areas, including Davis and Weber counties and parts of Tooele and Box Elder counties, have exceeded limits for what’s known as PM2.5 pollution — the prime culprit behind northern Utah’s wintertime pollution episodes — since 2006. 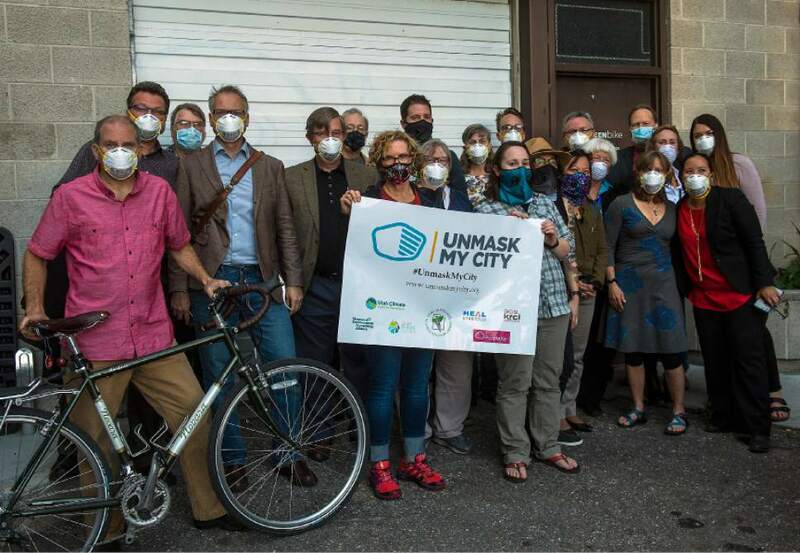 Physicians and environmentalists held an event late Tuesday as part of the Unmask My City campaign, an international effort to encourage doctors, nurses and other health care providers to become advocates for cleaner air in their communities. They have also launched a petition calling on state leaders to pass new pollution controls on dust from mining and emissions from diesel vehicles. News of the area’s redesignation by the EPA was no surprise to Simonsen, who said Utah’s air challenges were “nothing new.” The problem, Simonsen said, is not that Utah doesn’t know how to solve the problem, but that Utahns have proven reluctant to implement solutions. Other advocates felt optimistic that concern about Utah’s air quality is becoming mainstream and that more residents will begin to pressure their elected officials for change. In addition to government officials, Simonsen said he wants to see his church leaders — and those of other faiths — take a stand against pollution. But there is only so much state leaders can do to improve the air, said Ryan Stolley, program manager for the Utah Climate Action Network. Residents also need to make lifestyle changes — something Utahns have resisted in the past. Simonsen agreed, saying state lawmakers, local governments, business owners and residents all have a role.